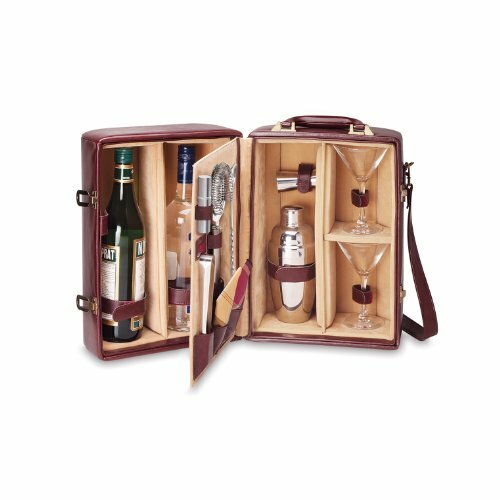 A Travel Bar Set Case is the perfect thing for Travelers who Love Their Cocktails. Anyone who ever has to go anywhere needs a Travel Bar Set Case. (Face it, even a quick trip to the grocery store could be vastly improved with a quick cocktail in aisle 3). These Travel Mini Bars are absolutely the BOMB. 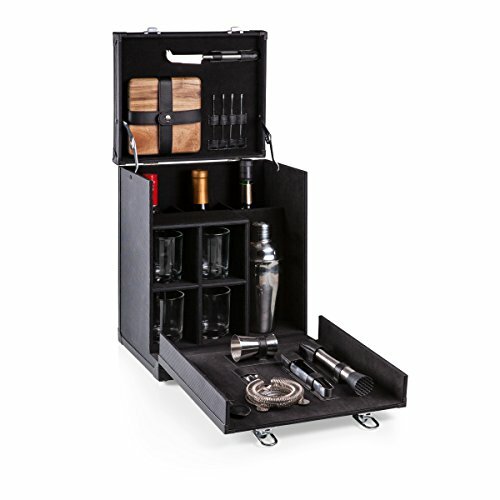 The leather cases hold bottles, glasses, cocktail shakers and all of the tools you need to create fabulous drinks for you and your friends. Added bonus… these Travel Cocktail Bars look super cool. Can you imagine arriving at your hotel with some friends, you pull out the case, snap open the locks, and BAM you are transported to the life of James Bond! Even if you don’t travel, these mini Cocktail bars are great to take along when visiting friends, especially those whose liqueur cabinet is … shall we say… lacking (heck, my Grandmother has a better stocked bar than most of my friends!). 0.1 Why Would Anyone Need a Travel Bar Case Set? 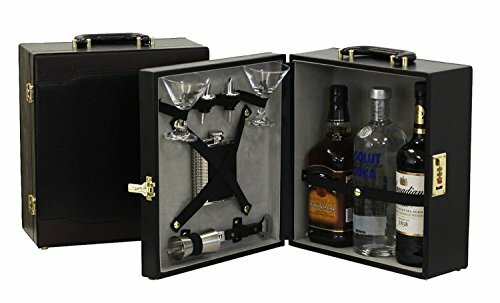 Why Would Anyone Need a Travel Bar Case Set? I don’t travel as much as I’d like to…. but when I do, a Travel Cocktail Bar is more than welcome to come along. -Cocktails in Hotel Bars can be pricey (and the drinks chintzy)…plus the view from your balcony is much nicer. -Your hotel doesn’t have a Bar (sigh… )…. and you don’t want to leave the building for a cocktail. -You are visiting friends who don’t have any of the proper tools to make a martini. This fabulous case has to be seen to be believed! The leatherette cover comes in a Mahogany/Tan or Black. 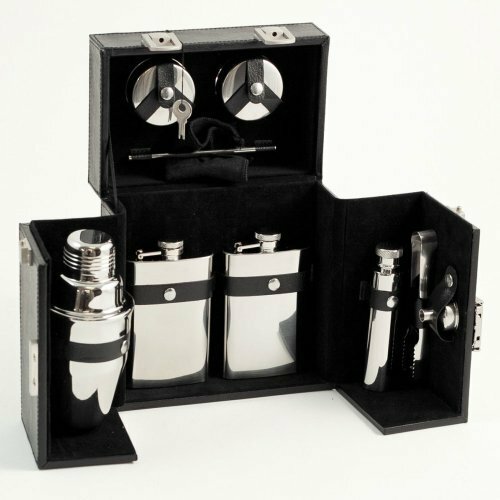 The beige velveteen interior holds bottles and tools with dividers and holders to keep them safe. The bag is fully insulated, to keep things cool. Carry the cocktail bag by an adjustable and removable shoulder strap, or by the suitcase handle. You can nestle 2 bottles safely inside the case. A divider keeps the tools and the two included glasses from jostling against them. Tools included are – Cocktail Shaker, Tongs, Jigger, Strainer, Olive Picks, Stirrer and Napkins. This Travel Bar is truly a party in a suitcase! The locking hard case holds 3 standard Fifth Bottles , so you can take your favorites, and something for your partner… It’s small enough at 13 x 12.5 x 6 to pack into a suitcase or weekender. Just tuck it in your bag and GO! The bottles are held in place with a strap that snap into place. On the other side of the bag are 4 metal cups, 2 Martini Glasses, 2 speed pourers, a jigger and a serving tray. All you need for a cocktail party on the road. You just need to supply the location… and maybe the olives…. This little black leather case fits easily into a bag (or maybe a drawer at work). But the size is decpetive, it contains all you need to make and serve cocktails. Included are 2 flasks, each hold 4 oz. and a transfer funnel so you can pour over from home. You also get a shaker to properly mix your ingredients. A stirrer, tongs and 2 collapsable cups complete the set. All pieces are made from high quality stainless steel. 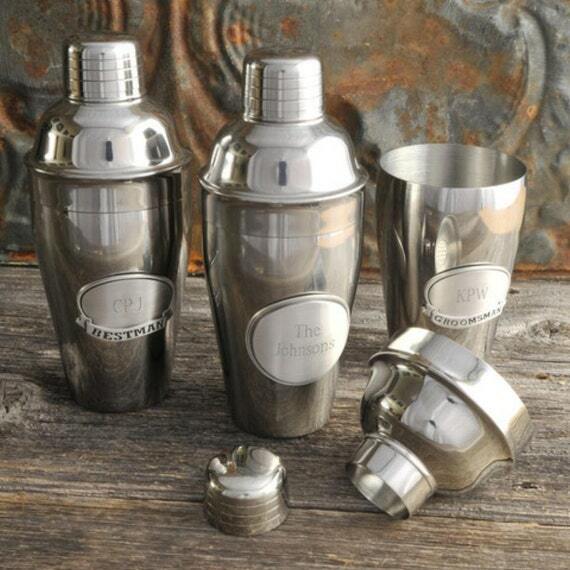 For the ultimate travel bar that holds EVERYTHING, you need the Picnic Time Legacy Collection Hamiltion Bar Set. This solid case holds 3 bottles of your favorite alcohol, 4 glasses (so you can serve you and your friends), and 16 bartending tools…feel free to muddle, mix, shake and strain to your heart’s delight. And because the responsible bartender makes sure his/her guests are eating a little something (so they can drink more), also included is an Acacia wood cutting board, and a cheese knife. I love how the case opens up on top, and in the front so that everything is easy to get at. Plus, it’s stable, so you don’t have to worry about it tipping over! This is the kind of travel bar Set that a whole party can center around!